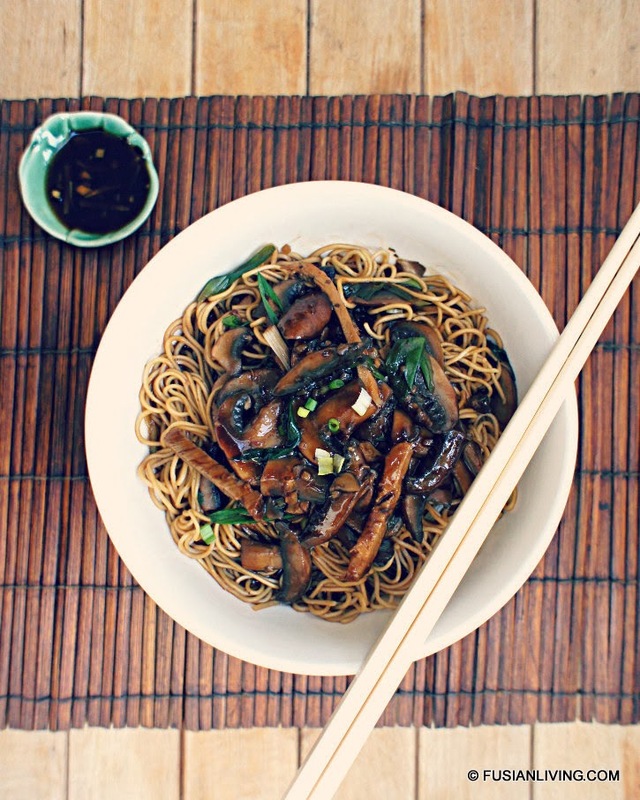 Chinese Noodles in mushroom & pork gravy | Grow Your Own Veg Blog. Gardening and Food Blog. There is a kind of noodle dish where the noodles are neither immersed in broth nor stir-fried in a sizzling hot wok. Instead, the cooked noodles are tossed in a deliciously rich, usually soy flavoured sauce, with each strand of noodle glistening with mouth watering gravy. I find this style of noodle the most comforting mid-week, when in the dark of the evening you arrive home, the mechanical hum from the long train journey still ringing in your ears and the ideas from an earlier brainstorming session still buzzing in your head. It seems like just hours ago that you were preparing the roast pork for last night's dinner, and now it is that time of the day all over again. Now, you are grateful for those store cupboard ingredients, which can often turn a few meagre ingredients into something truly special. Simple, basic mushrooms are combined with garlic, ginger and an array of Chinese sauces from the store cupboard to form the base of the noodle sauce. Roast pork leftovers are then added to the sauce and this delicious gravy is tossed over warm noodles. It's quick, easy, super tasty and one of my favourite mid-week meals. It is also perfect for meatless days - where I simply leave out the pork. We used Sainsbury's basics mushrooms and basics garlic. 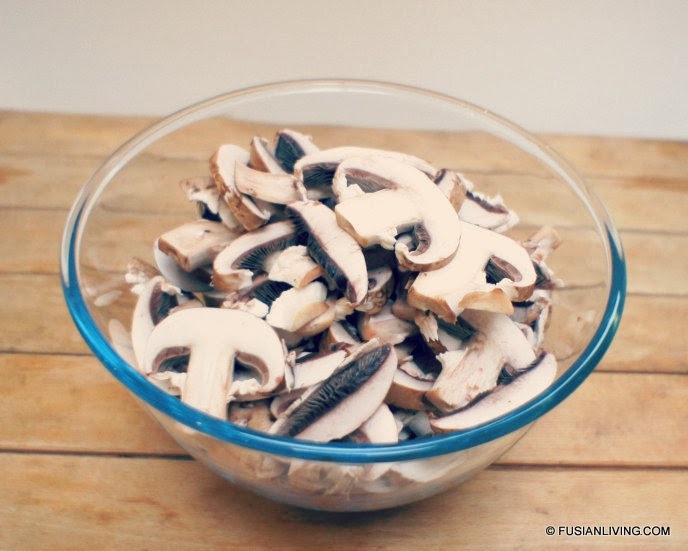 Try also a mixture of chestnut and Shiitake mushrooms. 1. Heat the oil in a wok or sauté pan over a medium heat until hot (but not smoking). Add the ginger and stir-fry for 30 seconds until fragrant. 2. Add the sesame oil, mushrooms and garlic and stir-fry for 3 minutes (making sure that the garlic does not burn). 3. Add the dark soy sauce, light soy sauce, oyster sauce and chilli powder and water to the pan, and bring to a simmer. 4. Add the pork and spring onion whites and simmer for 4 minutes until pork is piping hot. 5. Reduce heat to low. In a bowl, blend the cornflour with cold water and gradually add to pan, stirring to combine. Stir frequently until sauce is thickened. Finally, add the spring onions greens. Note: to avoid lumps in the sauce, stir the cornflour mixture to make sure it is fully combined, before adding to pan. 6. Cook the noodles in boiling water for 3-4 mins, or according to pack instructions. Drain the noodles, reserving the liquid. 7. Serve the noodles into individual bowls. Ladle over the mushroom sauce and add 1-2 tablespoons of the noodle water, and toss through. Sprinkle over spring onion garnish. Tip: For some green freshness, top with some fresh watercress. As products may vary in flavour depending on the brand, season to taste by adding more oyster sauce or dark soy sauce.